First, a little context. In 1907, Justice Higgins made the point that wages should be sufficient to maintain workers and their families in “…frugal comfort...” (it was known as the Harvester case). The idea was derived directly from Leo xiii’s encyclical Rerum Novarum and provided a method of balancing the competing interests of employers and employees. In recent years, that principle has come under serious threat, and the commercial music industry provides an example of just how far it can be diluted. Commercial venues only hire bands because they attract crowds. Bands know that they must attract a crowd if they want to be paid reasonably. The traditional way to achieve this was to play a popular repertoire presented in an entertaining manner to ensure repeat customers. It gave bands a path to follow in developing their acts. 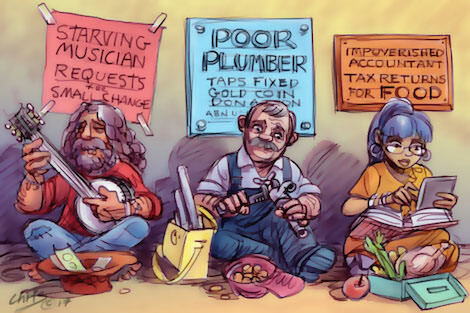 Successful musicians, in this view, were those who derived a living income from their musical activities: working musicians. It is a reasonable arrangement and creates a supply and demand relationship between venues and bands. The amount of properly paid work for musicians under this system is potentially vast. Musicians’ employment, which is covered by a series of awards that govern minimum pay including penalty loadings, meant that musicians could, and often did, take venues or promoters to industrial tribunals if they were underpaid—although usually they were paid considerably higher than these minimums. It all changed when new profit/risk sharing arrangements were introduced, such as the ‘door deal’. The industrial relationship between venues and musicians could now be construed as a contractual, rather than an employment, one. It meant awards were potentially no longer enforceable. Meanwhile, a coalition of large promoters, recording companies, music managers and broadcast media— which constitute the ‘Music Industry’—pushed a different view. For obvious reasons of self interest, they consider that only those who create original music are musicians, and that they should aim, after a period of ‘paying your dues’, to secure a recording contract, engage a manager and enter into competition with other original acts to become famous and consequently derive high returns from both recording sales and public performance. The tools that the music industry traditionally uses are media airplay, promotion and widespread distribution of recorded product. If an act is not chosen for a shot at success, those tools are not available. Although the internet has changed how the tools are applied, the industry’s power remains. Consequently, only a very small number of acts can actually achieve sufficient notoriety to make even a modest income. The proportion of musicians who receive more than a pittance from recording sales under this system is so small as to be statistically negligible. "This whole chilling story provides an early insight into how bad things can get for Australian workers." Nevertheless, the idea that musicians should only perform their own compositions became pervasive, along with the notion that this is the only way that musicians become ‘artists’. It probably owes something to a nostalgic echo from the Romantic poets. Of course, the Romantics were people of independent means who could afford to deride the notion of earning an income. The myth has been fostered by music journalism that concentrates on the perceived political and social content of music, and especially the lyrics. This school embraces the music industry’s myth wholeheartedly. It meant that a large number of acts emerged whose product was unfamiliar to the public and so not capable of attracting regular large audiences. These musicians fervently believed that they could all ‘succeed’ if only they were given the opportunity of sufficient exposure. The final stage was the creation of a business model which eliminated the payment for product. Even if they had eliminated risk with door deals, venues were reluctant to hire unknown bands because they would not attract a crowd. Some venues realised that there was a large pool of musicians who were prepared to work for little or no money to get ‘exposure’. Any band could drum up 30 or 40 people for what they saw as their big opportunity, merely by using family and friends. They might be able to do it only once or twice, but that did not trouble the venue because the supply of willing bands was enormous. As long as the venue used three, four, or even five bands the venue would be full and the outlay no greater. Because of the size of venues, and the door charge that the public will accept, it was impossible for musicians to make anything like a reasonable income—or anything at all—under this model. Worse, under some versions of the model, bands are required to pay overheads meaning they not infrequently have to ‘pay to play’. Venues, meanwhile, have a sound business model based on eliminating any rights for the workers who make it function. The final irony is that governments of all political stripes not only accept this model, they support it. This whole chilling story provides an early insight into how bad things can get for Australian workers. There are strong echoes of it in the removal of penalty rates, the long list of employers found underpaying workers, the casualisation of employment and the replacement of employees with contractors such as the latest scandal of cleaners in Victorian schools. We ignore it at our peril. Terry Noone is a teacher and was formerly the Federal Secretary of the Musicians Union of Australia. Music ain't a job! I remember when muso's, like cricketers and footballers, played because they loved their music and their sports and worked in 'proper' jobs for their sustenance. Then the exploiters arrived, making money out of the amateurs' talents. Then came the unions and in return for subscriptions and power wielded through boycotts turned a human social pastime into an essential occupation and made people pay for their enjoyment. We humans are a wonderfully destructive mob! Absolutely spot on Terry. Sadly this is the way the neoliberal policies are going in this country. Sadly the workers party (Labour) have totally lost the plot .Workers lose out , employers win. Thank God I am now retired, but I sure feel for my kids' future. My daughter is a musician, so I know how hard it is to make a living. But what about the publishing industry ? I am a published author with an Australian publishing company. My book retails at $34, and my royalty is $1 per book !!!!!! John Frawley, there was a time when farming wasn't a job, nor making spears. People can have hobbies like sport and music, but when businesses make money from the activity, and the athletes and artists give up valuable time in order to perform to a high standard, give me a good reason why they shouldn't be paid for their abilities and performance. You ask a very difficult question, Lionel. I suppose payment for work is a variable and used to be based on productivity, hours spent, or quality of outcomes. In other words there was a judgement made regarding the value of the work. I find it difficult to relate the pay of sportsmen or entertainers for a performance lasting a couple of hours, for instance, to the payment to an unskilled labourer working on a high rise building site with all its dangers who is paid a pittance in comparison. Is the performance of an entertainer as valuable to society as the work of a nurse or paramedic? The relative pay of the latter two suggests that our society answers "NO" to that question. My answer to your question would be that there is nothing wrong with artists or athletes being paid for what they do provided that payment is in line with value relativities. If that were implemented, they would be receiving the pittance and having to sustain themselves in a "proper job". (Payments to footballers, for example, are obscene compared with payment to nurses). Of course, to maintain value relativity, society would go broke simply because the least valuable occupations in our society are often the most costly and to pay for value we simply couldn't afford it! In my experience, musos perform because they love to perform, just like people write barely read novels or opinion pieces. In most cases, if music venues or websites such as this one had to pay award rates they wouldn't exist and therefore wouldn't provide a stage for musos or writers to perform. Would you be happier with that? If we were to accept John Frawley’s attitude, we would never hear a symphony orchestra play Beethoven: they would never acquire the skills to play to recording standards because they would be too exhausted doing what he imagines is a ‘real’ job. ‘Social pastime’ indeed. Why should people who enjoy lawyering or doctoring or politicking or teaching or nursing be entitled to wage justice so they can earn a living wage but people who enjoy painting, or dancing or making music etc. should not? At his and my funeral(s), the judge, lawyer, nurse, doctor, teacher etc will be useless, but the organist, the grave digger and the flower arranger and the artists who recorded music will all be highly significant and worth a fair recompense. I don’t understand Mark’s readiness to jettison award rates just so venue proprietors can make more profit at the expense of the people who spend their skill, effort and time making it for them. I have news for him: playing music is work even if you enjoy it. Is he suggesting we should only be paid for work we don’t enjoy doing? Preposterous. Work should be recompensed fairly. Award rates are minima arrived at after consideration of competing factors. If a person doesn’t want to pay award rates, if they want to exploit, i.e. steal from, people, they should get out of business and just rob banks – at least it would be more honest. Musicians put a lot of time, money and energy into their craft. Only 2 hours on stage, but what about the countless hours of preparation? The stress of wanting to be a full time musician and not having a bright future etc. The anxieties. It's not all black and white. Cometh the hour, cometh the third murderer. So now inequality is in the spotlight and is being booed off the stage. It is blamed for the rise of populist politics, and more fundamentally for economic stagnation. The economic neo-liberal orthodoxy, that so implausibly claimed that economic competition unfettered by government regulation would benefit all of the citizens, has produced the gross inequality that hinders economic growth.